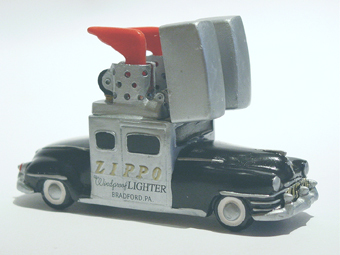 Amidst the cheering crowd of fans and topped with a party hat, the Zippo Car blew out its own candles on Saturday, July 19, 2008. 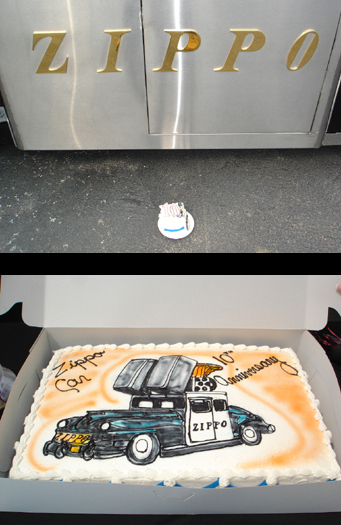 When former Zippo Car driver and now Events Marketing Manager Brent Tyler revved up the Car, the air from the exhaust quickly extinguished the flames of the candles atop the non-edible cake while current Zippo Car driver Amber Bacha looked on. 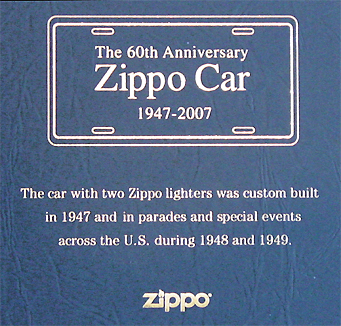 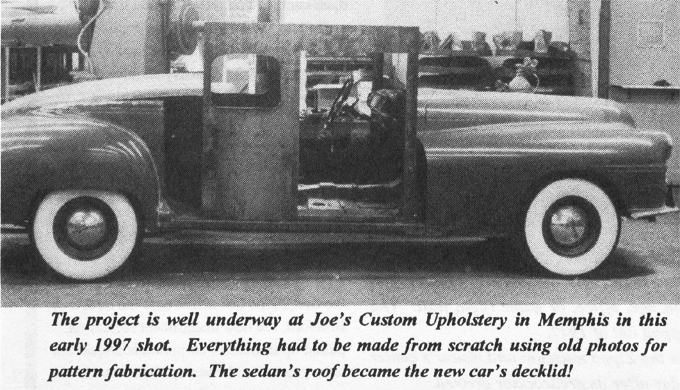 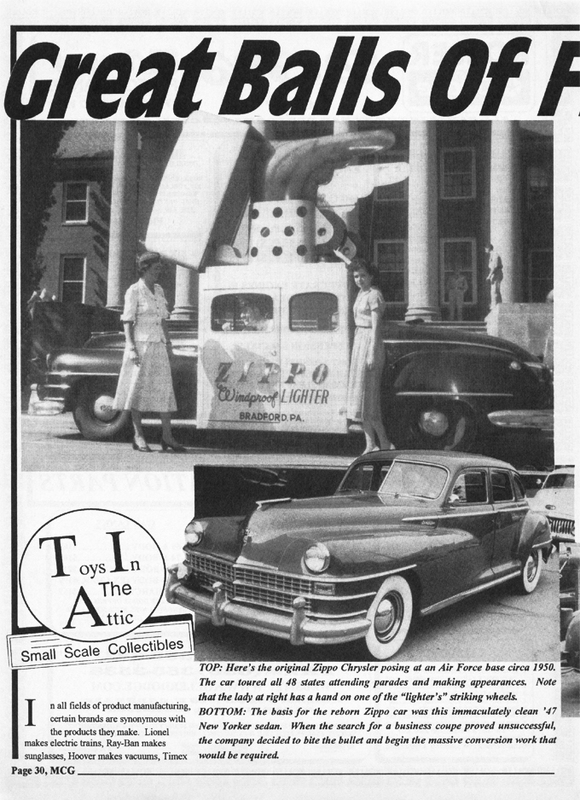 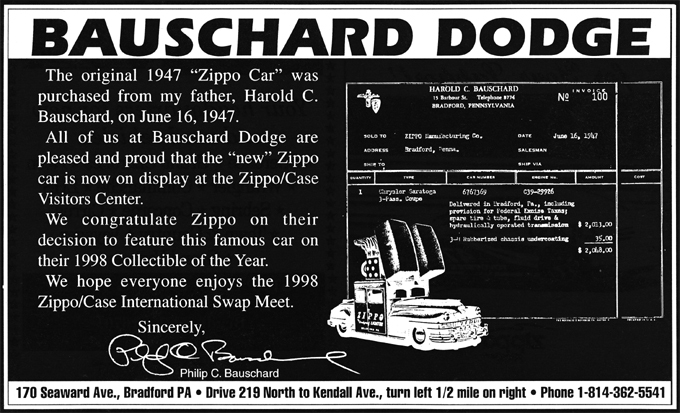 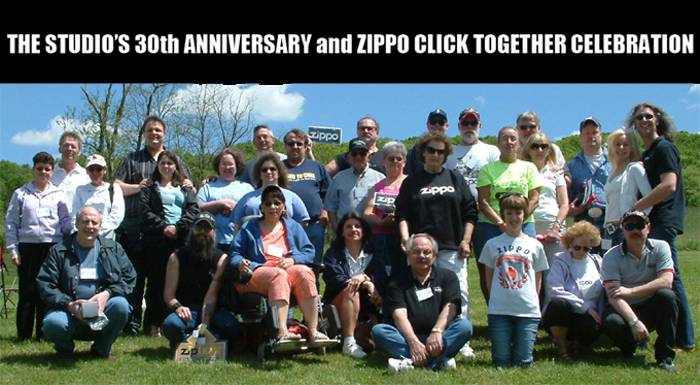 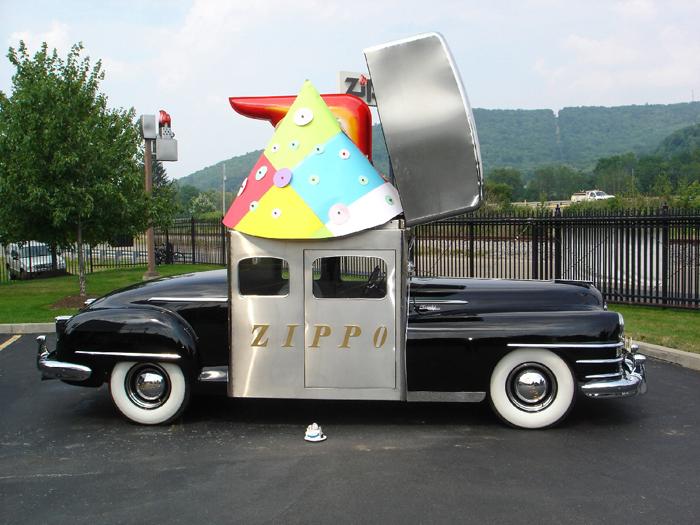 Appropriately, the celebration took place in front of the Zippo/Case Museum in Bradford, Pennsylvania where the Car was originally unveiled in July 1998 during the Zippo/Case Swap Meet. 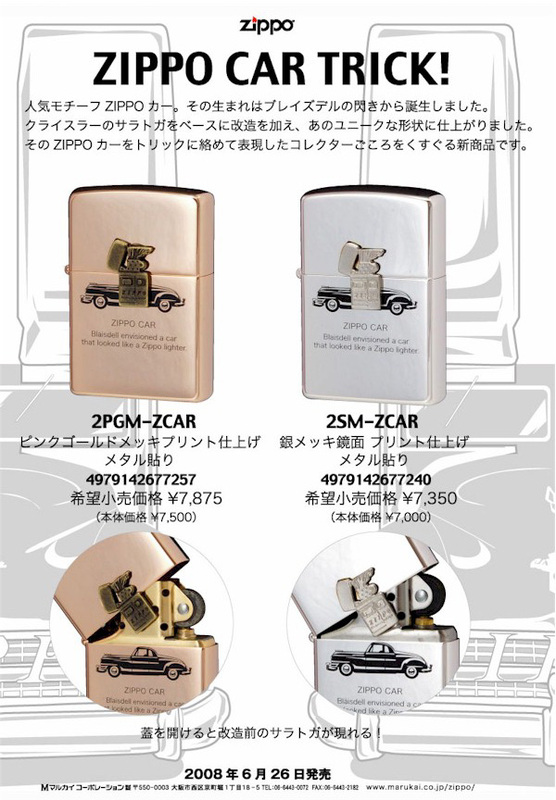 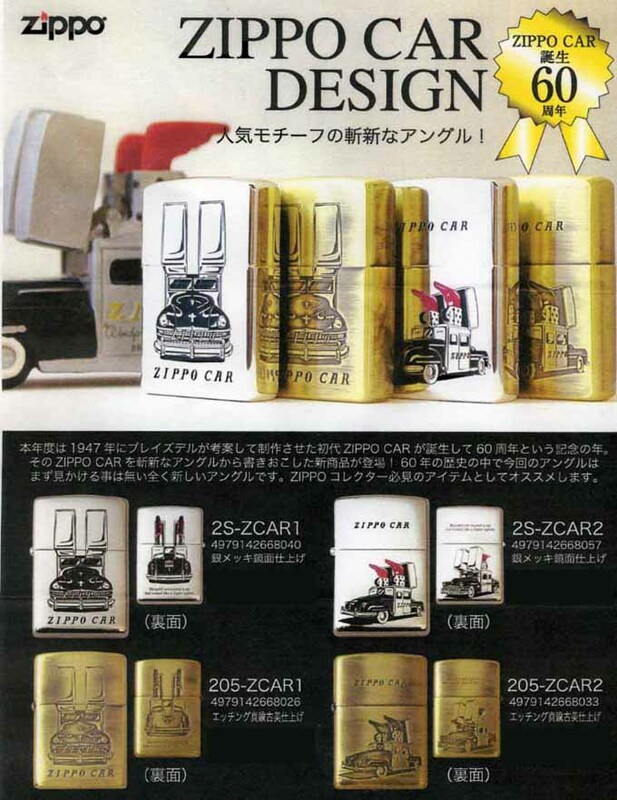 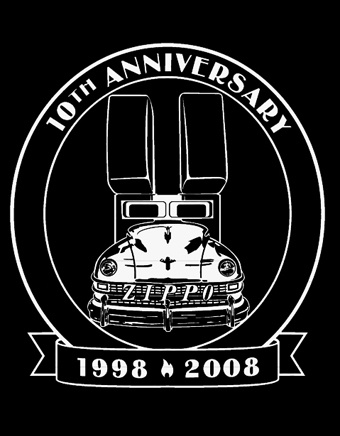 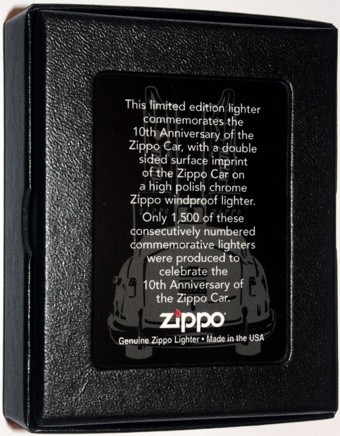 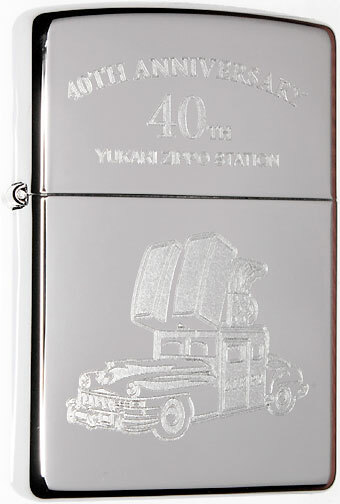 Its birthday present, however, was the release of 1,500 consecutively numbered limited edition 10th Anniversary Zippo Car Collectibles in its honor. 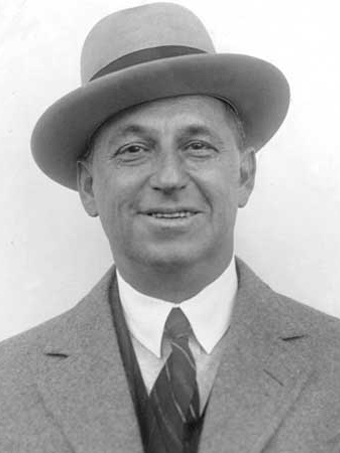 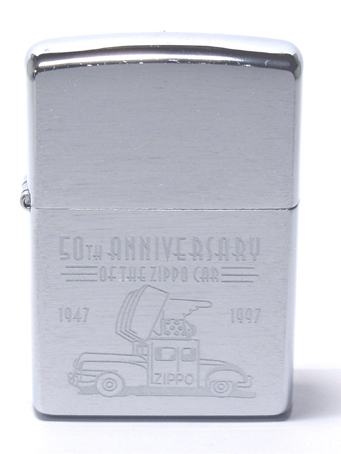 for the 75th anniversary of Zippo Mfg.Co. 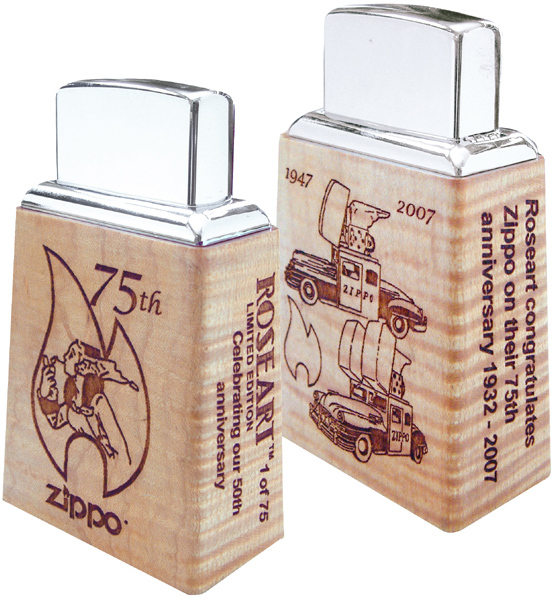 and the 50th anniversary of Roseart Co.
& two 75th anniversary postcards packaged in a leatherlike black cardboard box. 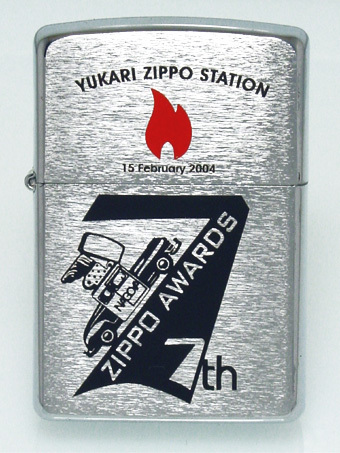 the collectible of the year 1998. 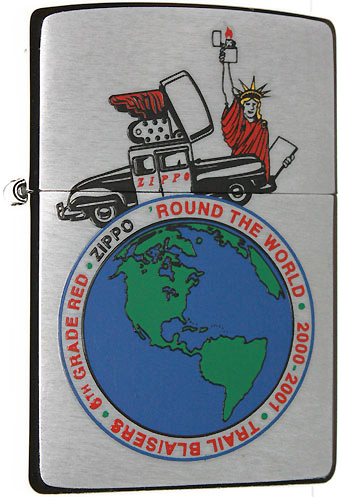 Myrtle Beach, Sturgis, Knoxville & Watkins Glen. 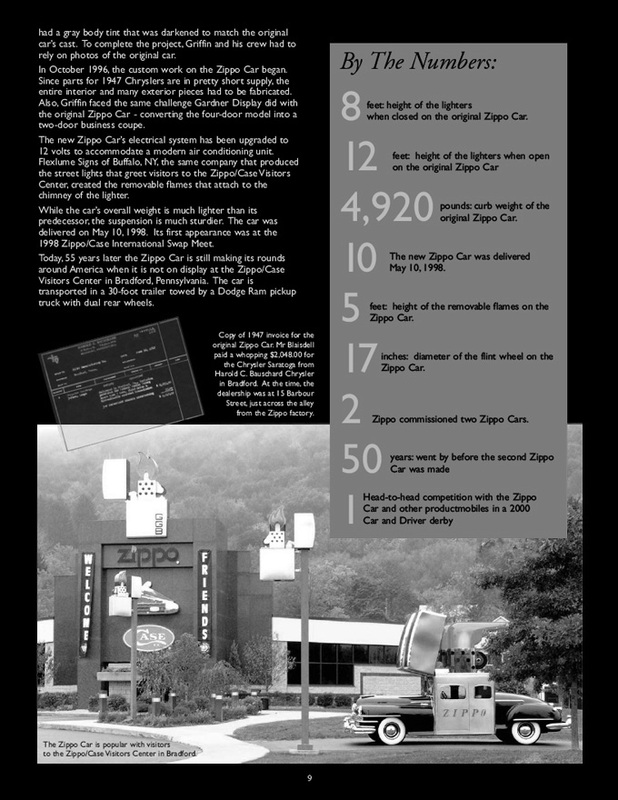 at the famous races at The Glen race track. 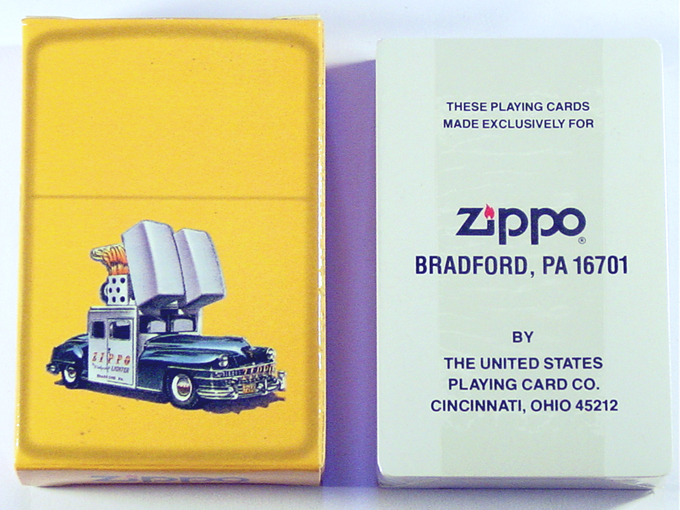 by The United States Playing Card Co. in 2002. 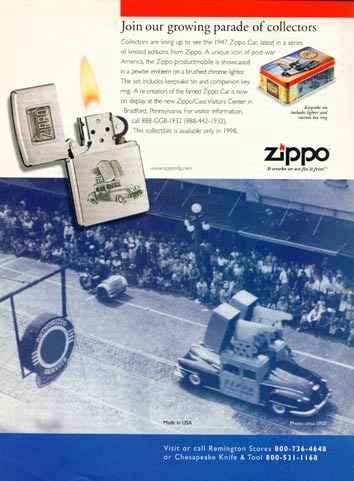 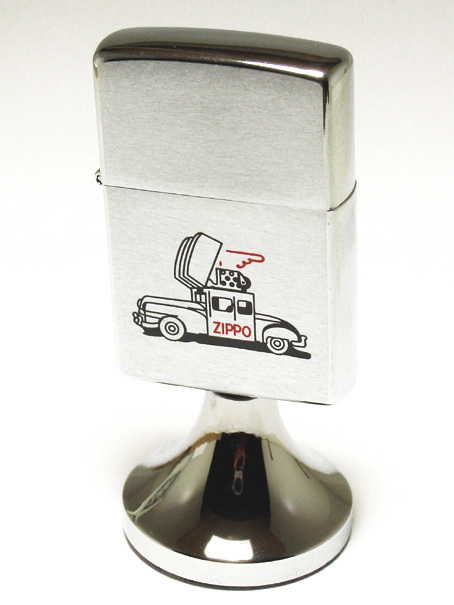 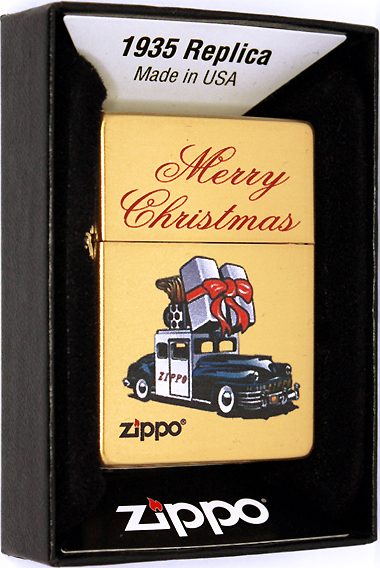 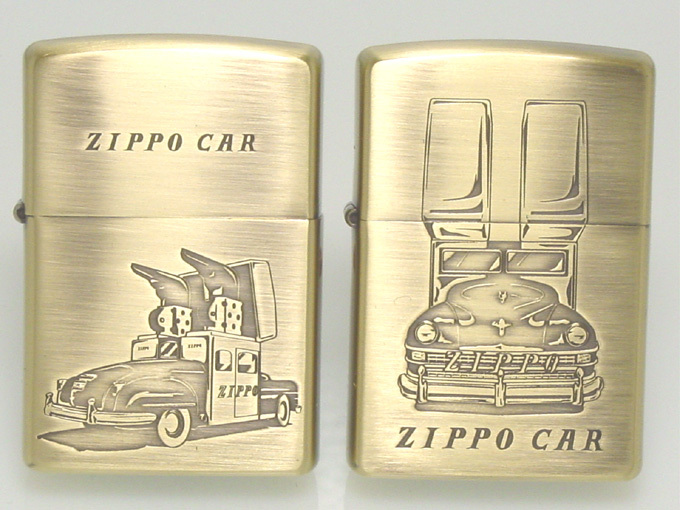 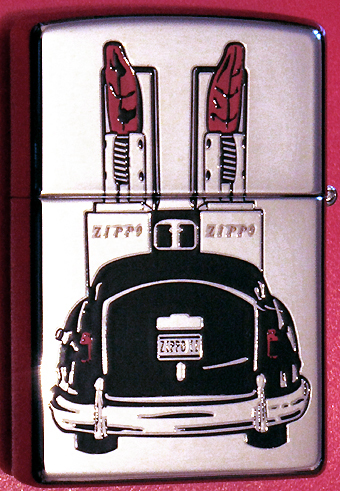 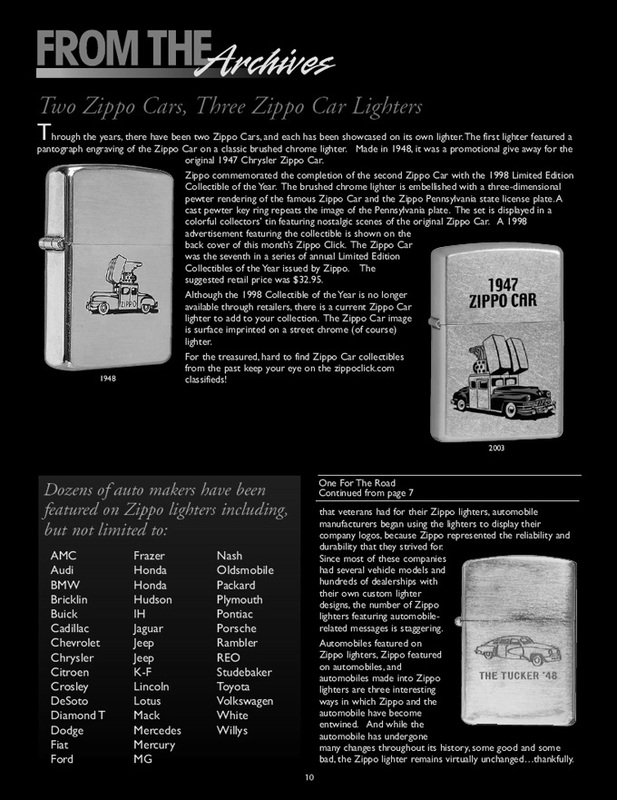 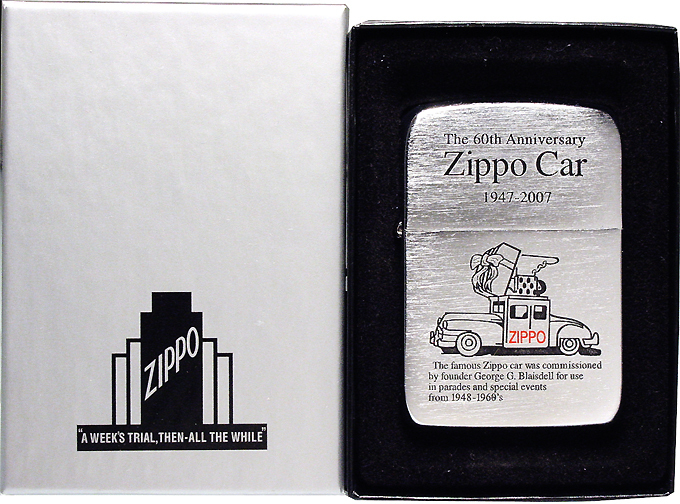 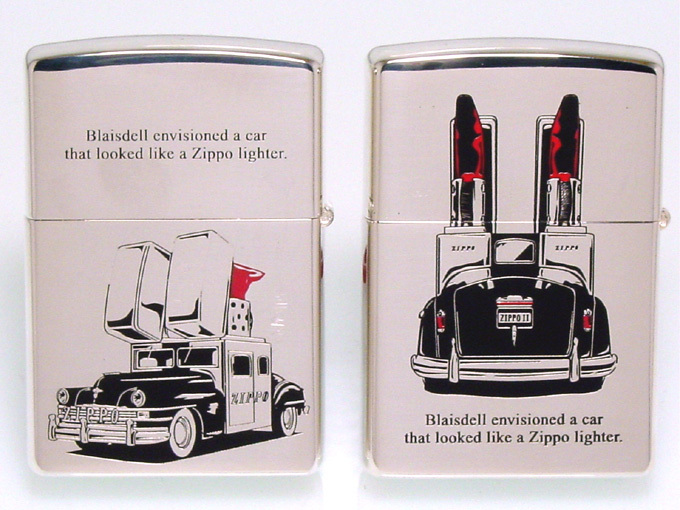 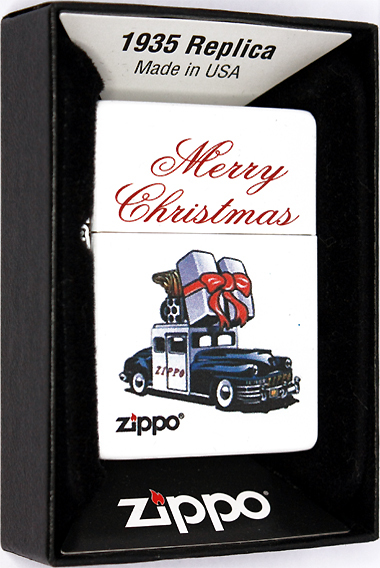 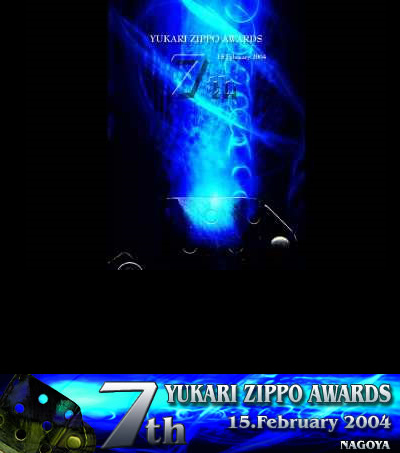 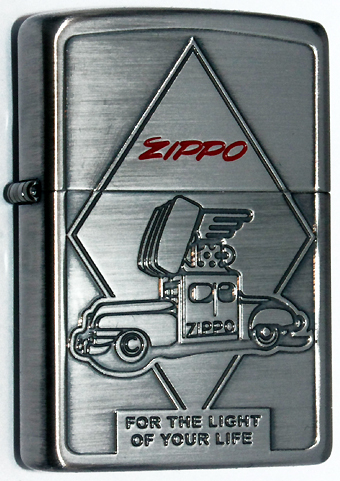 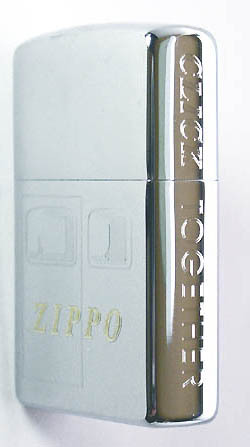 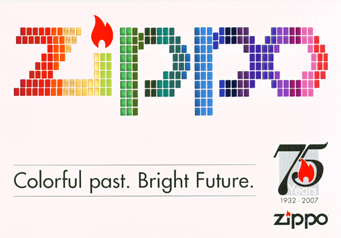 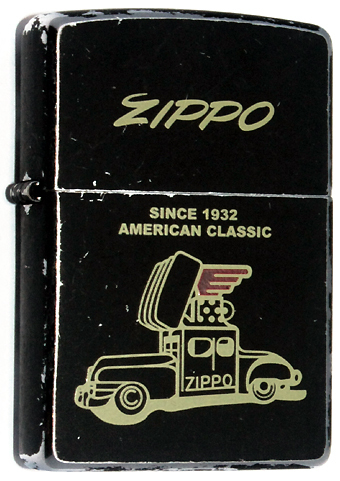 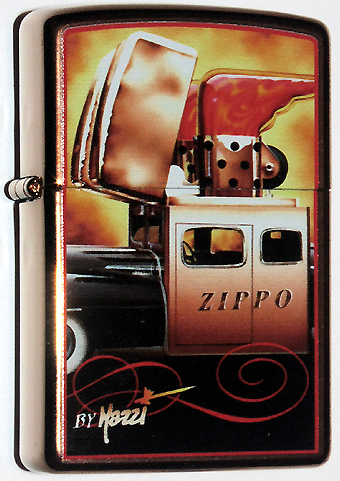 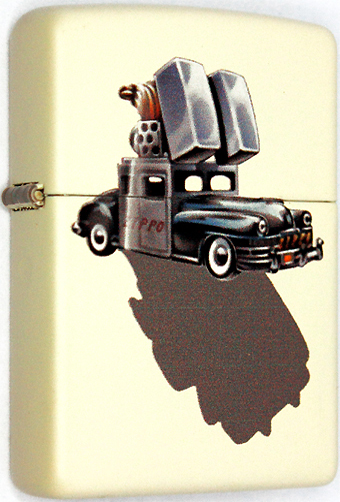 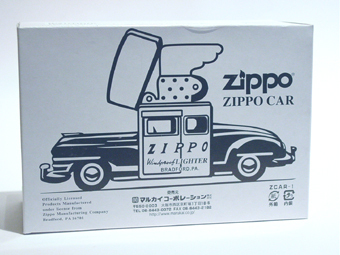 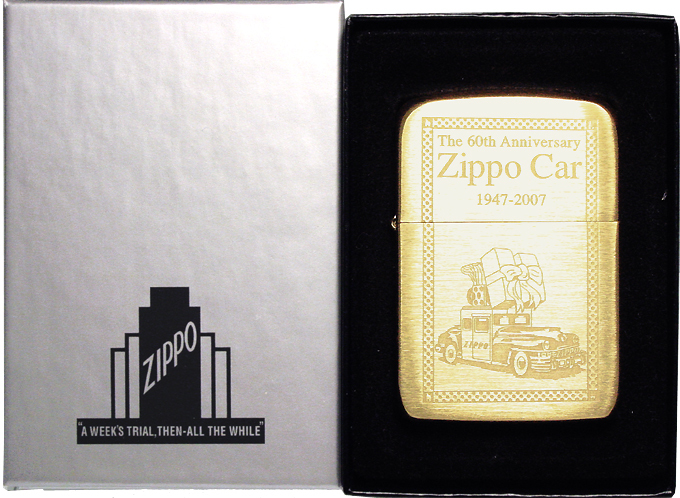 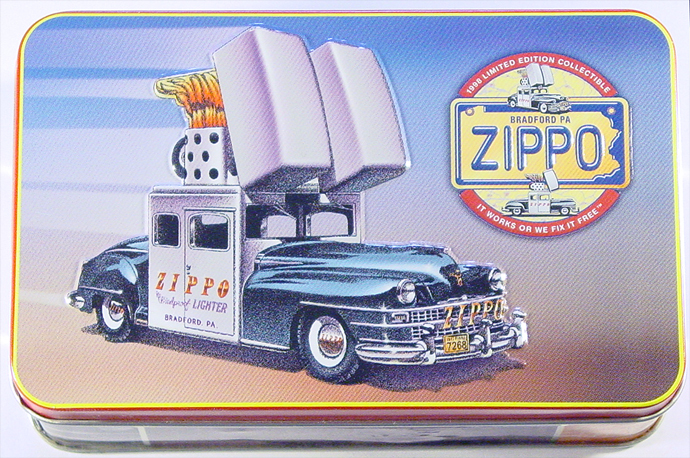 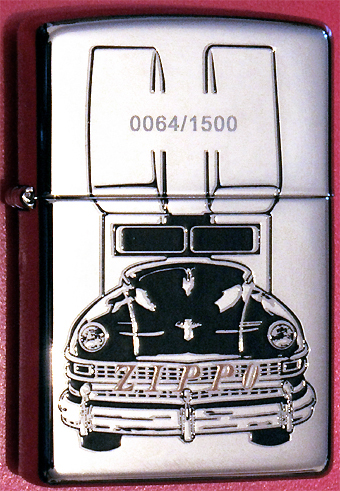 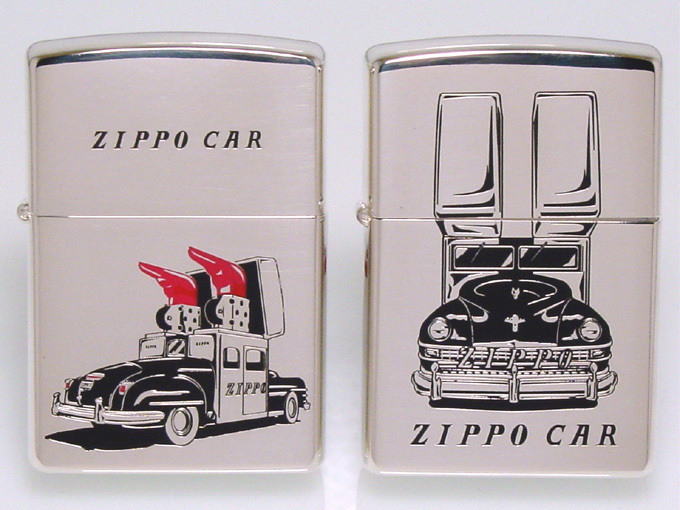 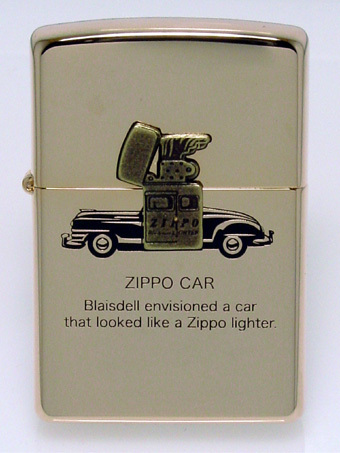 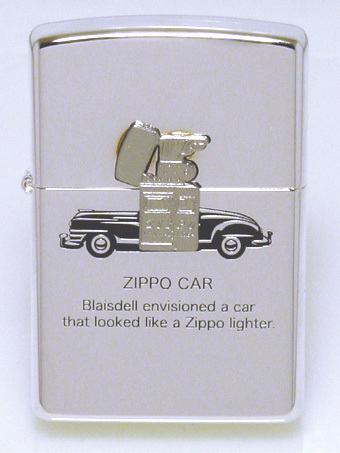 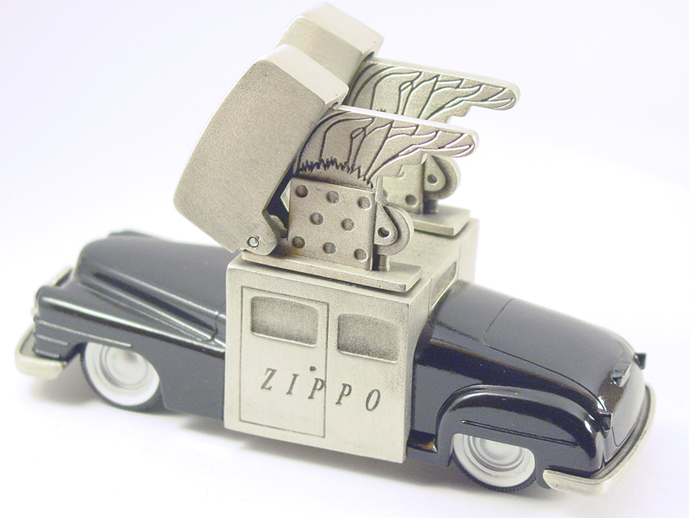 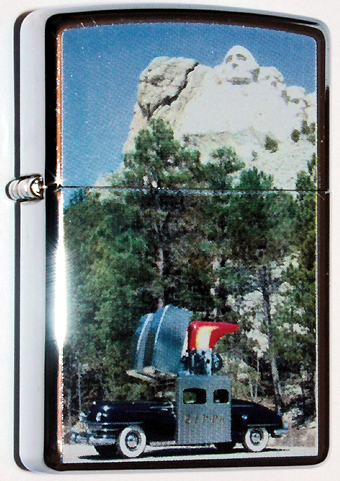 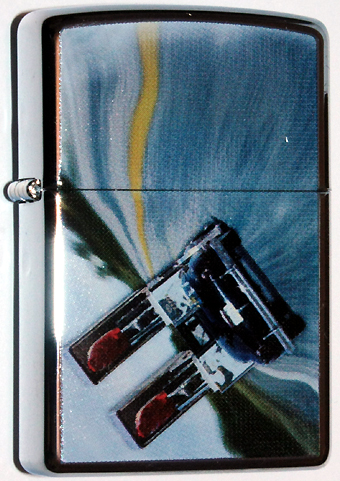 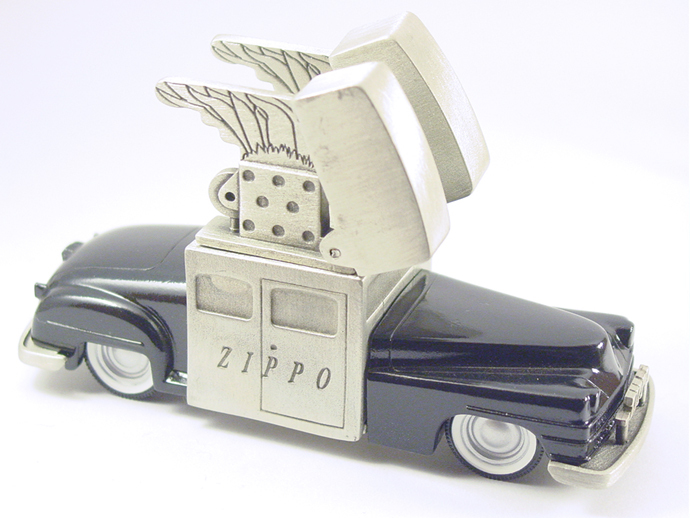 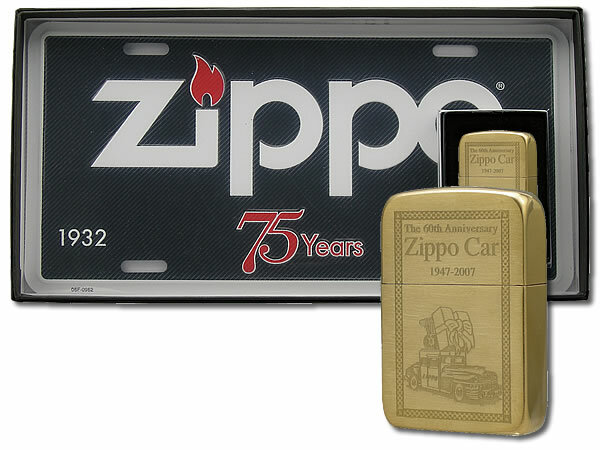 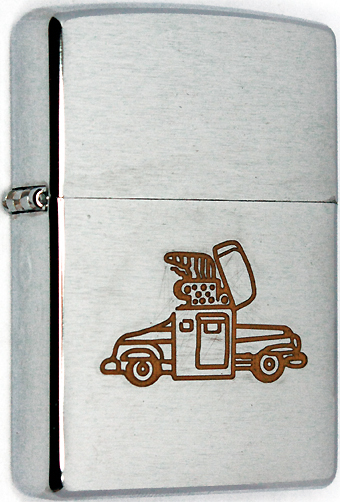 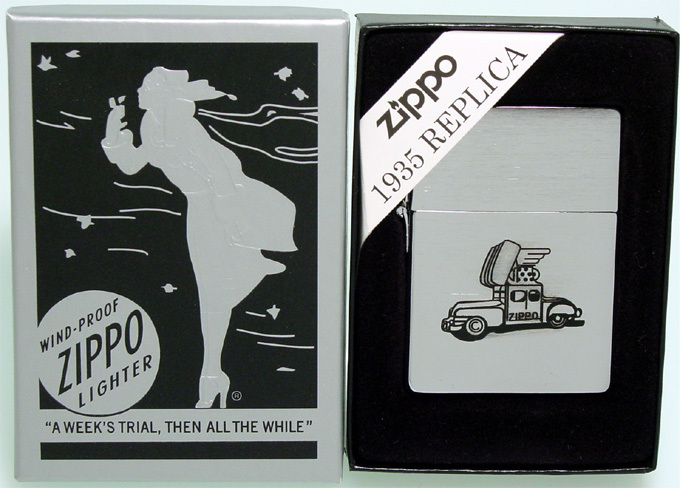 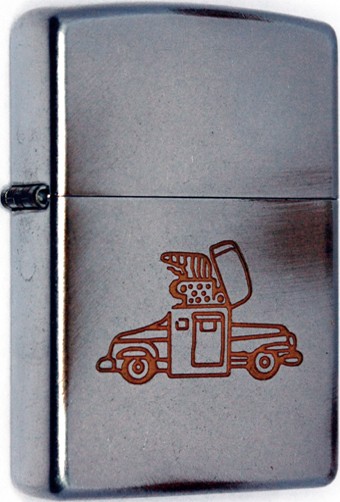 The 1998 Collectible of the Year honors the re-introduction of the Zippo car. 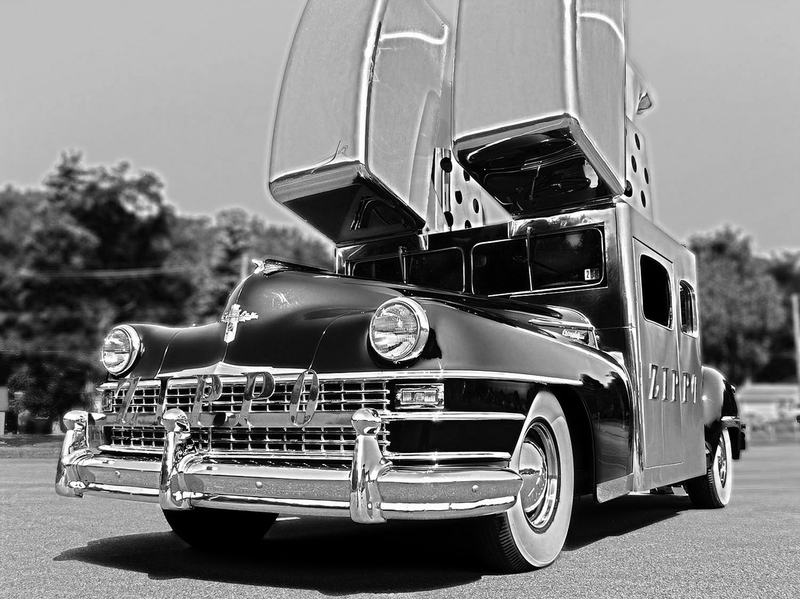 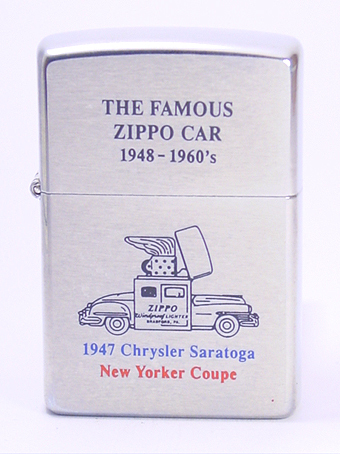 During the late1940s and early 50s the Zippo Car won America's heart, appearing in parades, expos, and fairs in all 48 states. 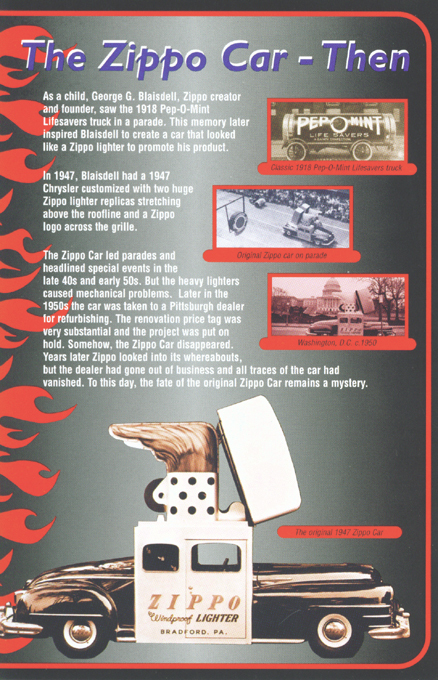 It disappeared under mysterious circumstances in the early 1970's. 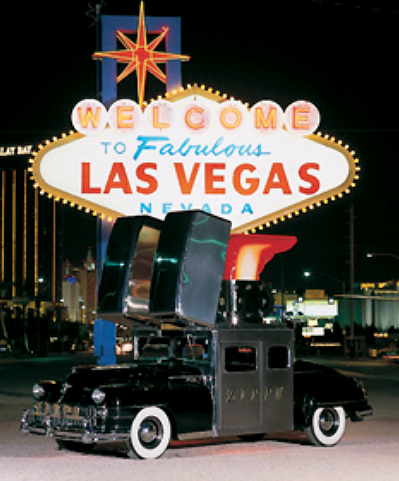 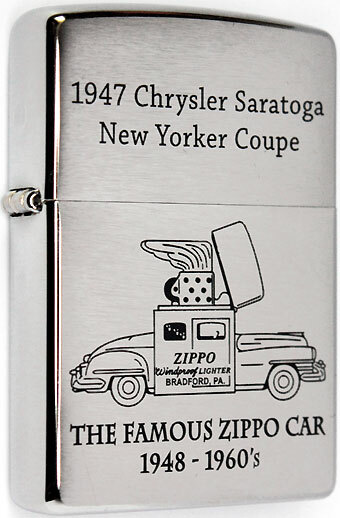 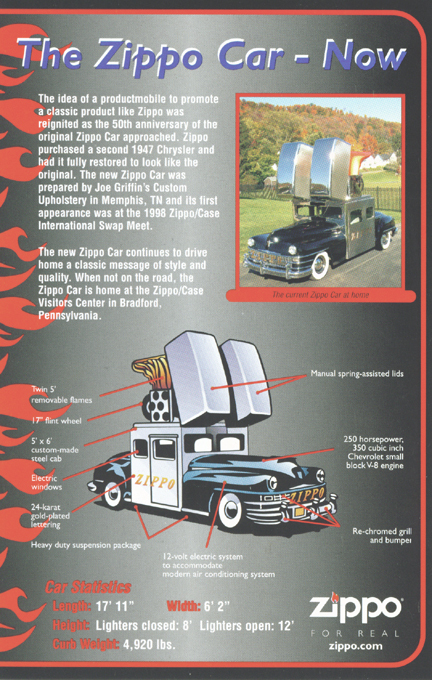 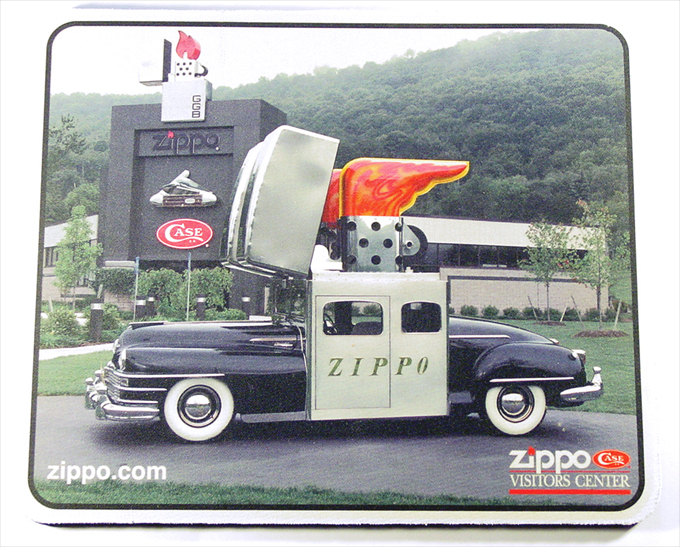 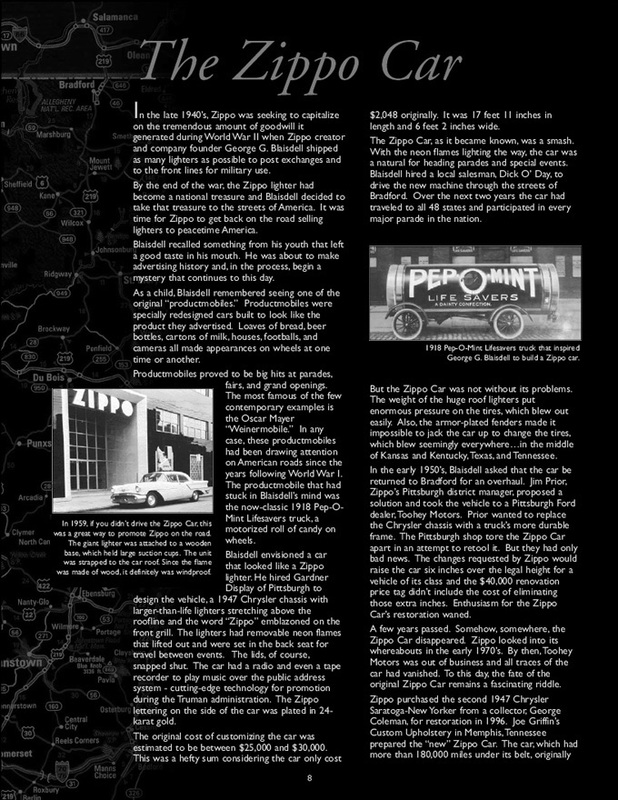 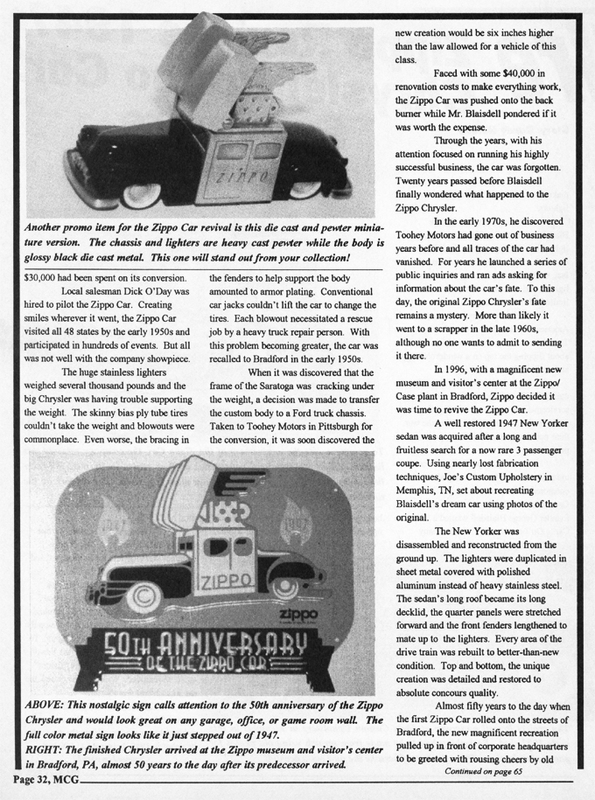 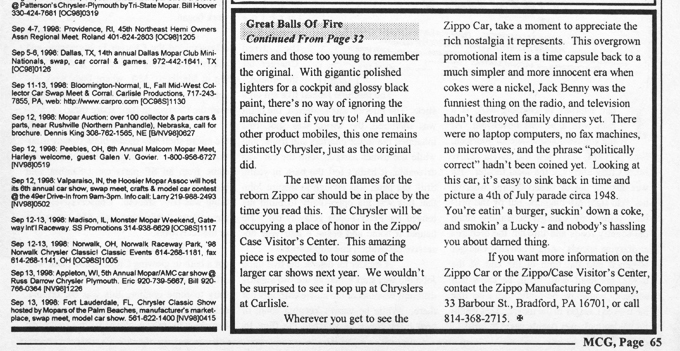 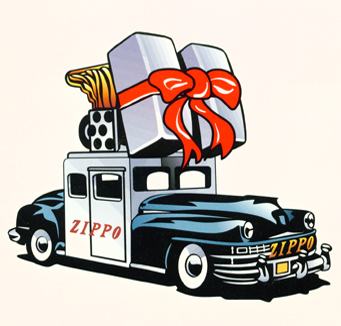 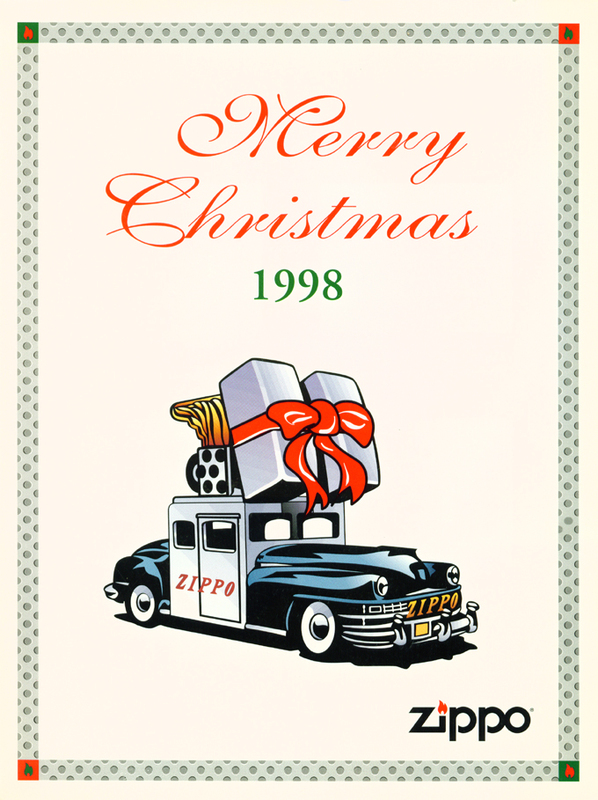 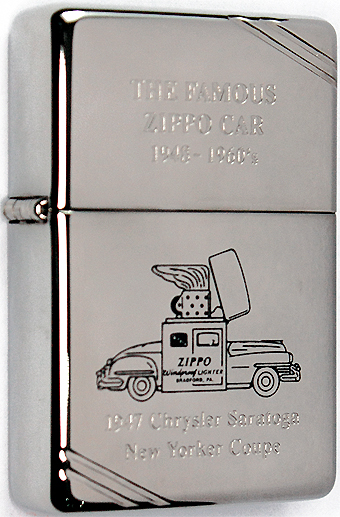 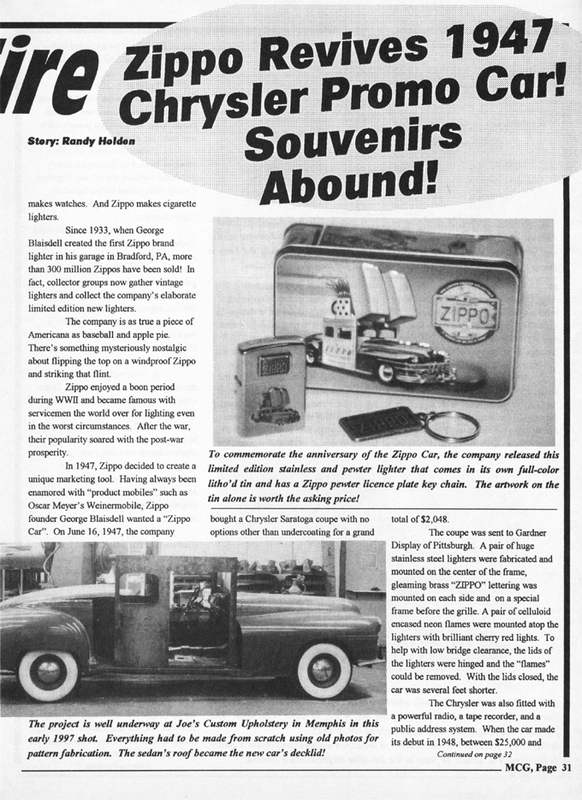 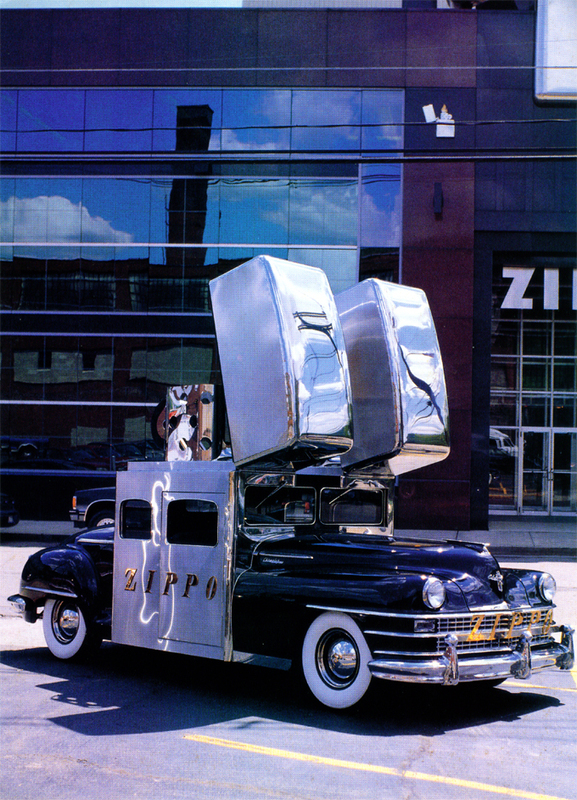 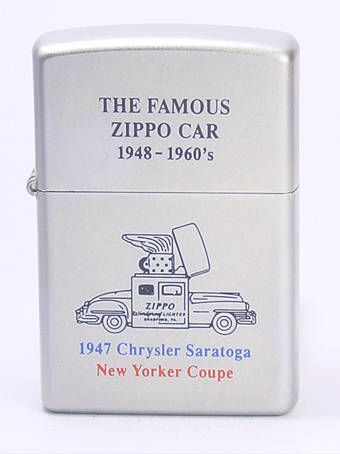 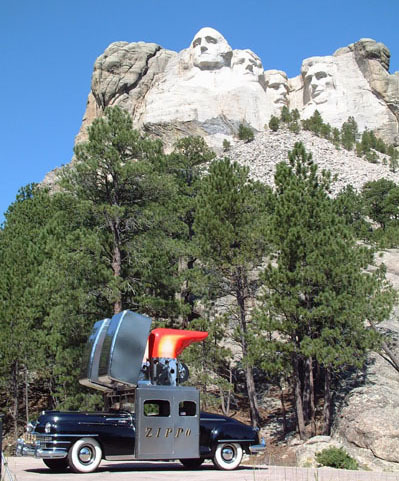 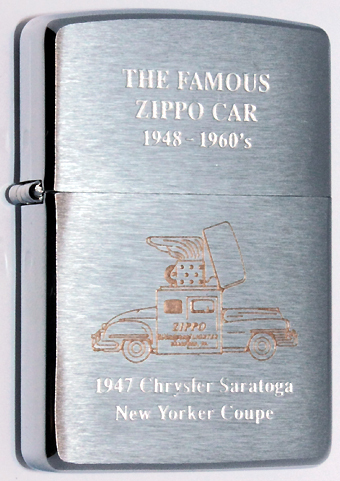 In 1996, Zippo commissioned a replica of the original Zippo car, and in 1998 the second Chrysler Saratoga - New Yorker, complete with two giant lighters with windproof "flames" stretching above the roof line, was unveiled at the Zippo/Case Visitors Center. 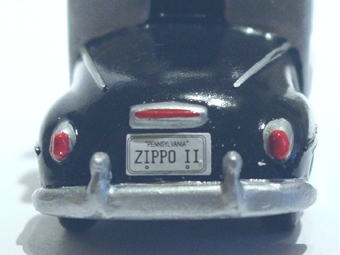 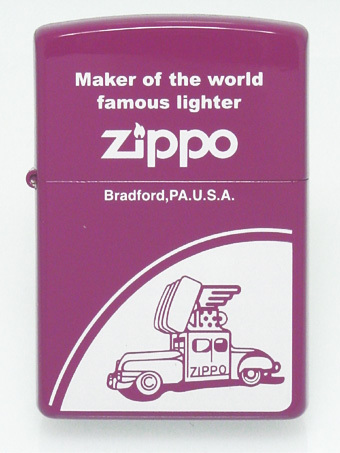 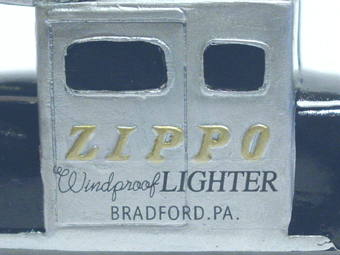 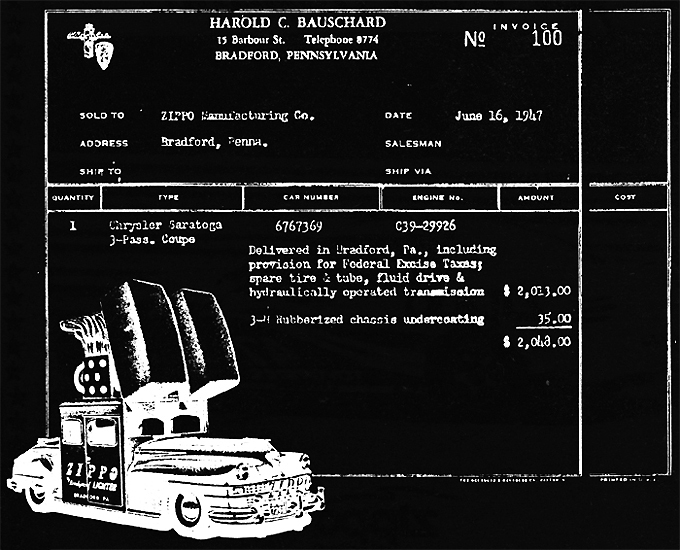 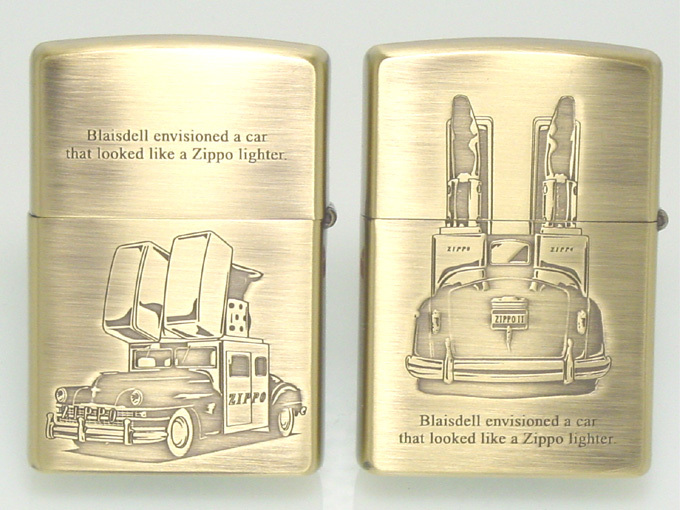 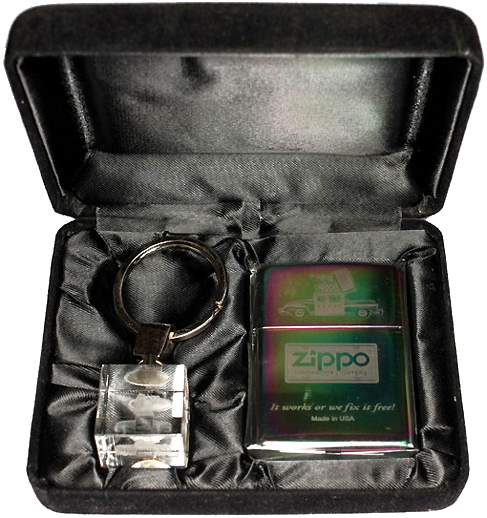 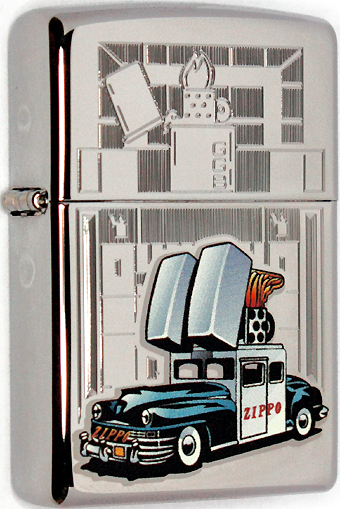 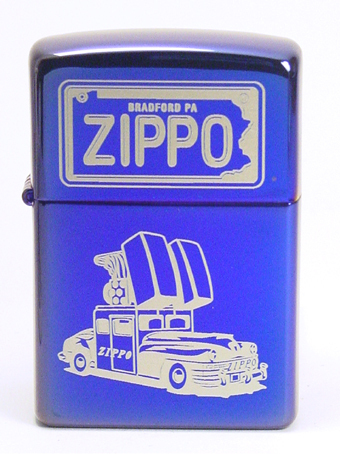 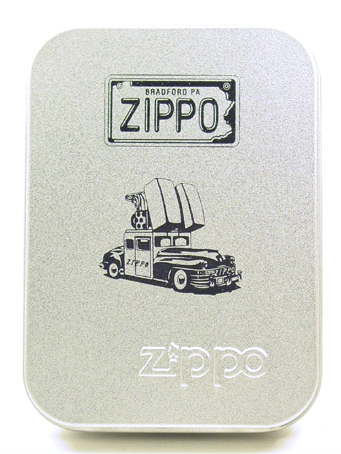 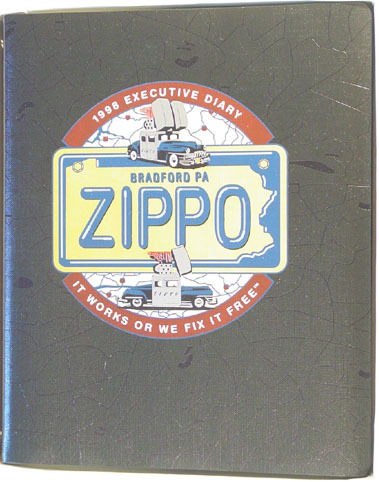 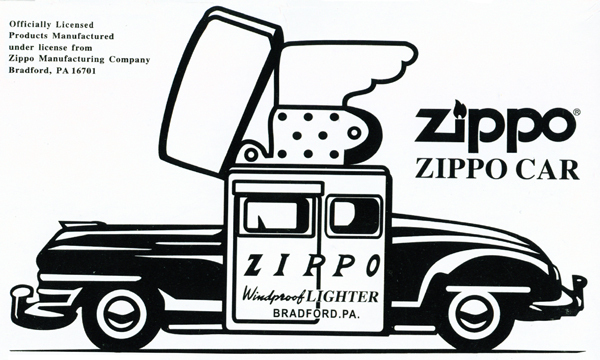 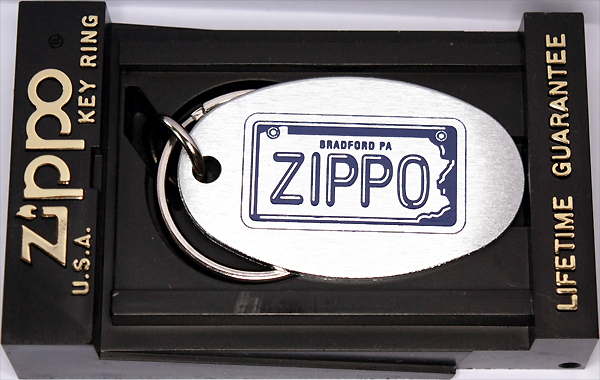 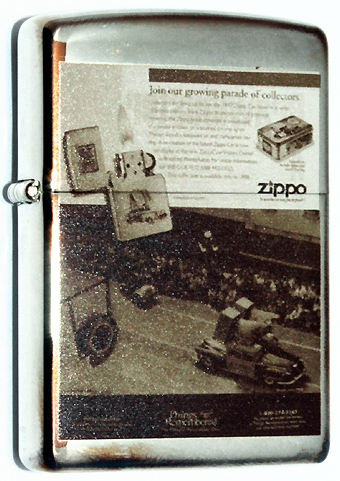 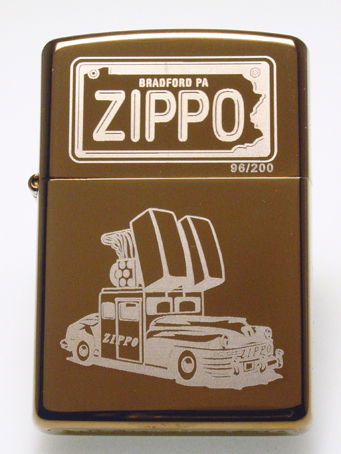 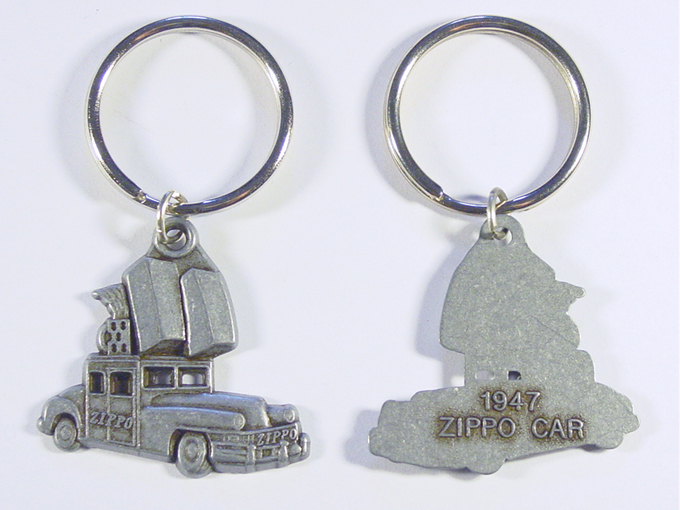 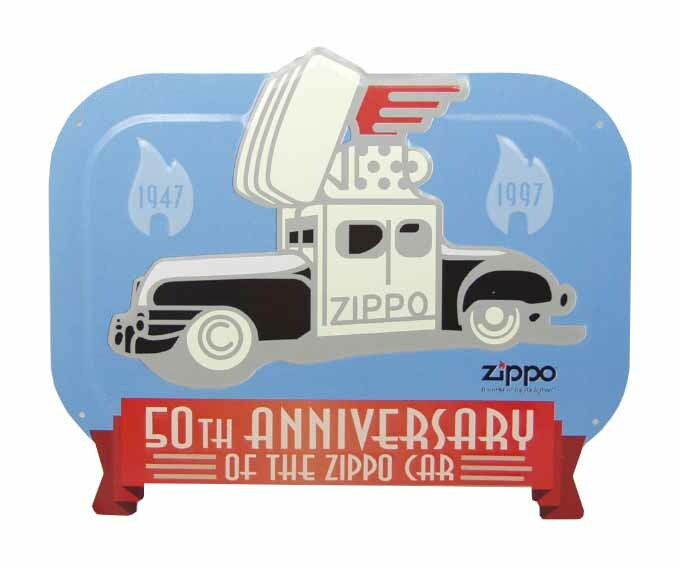 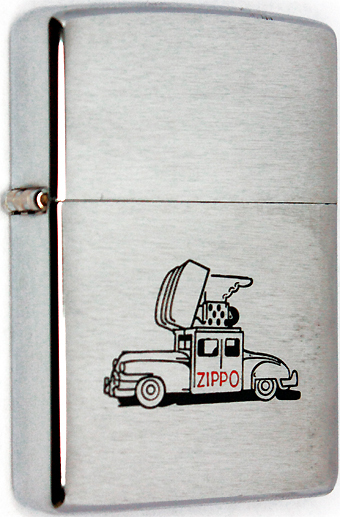 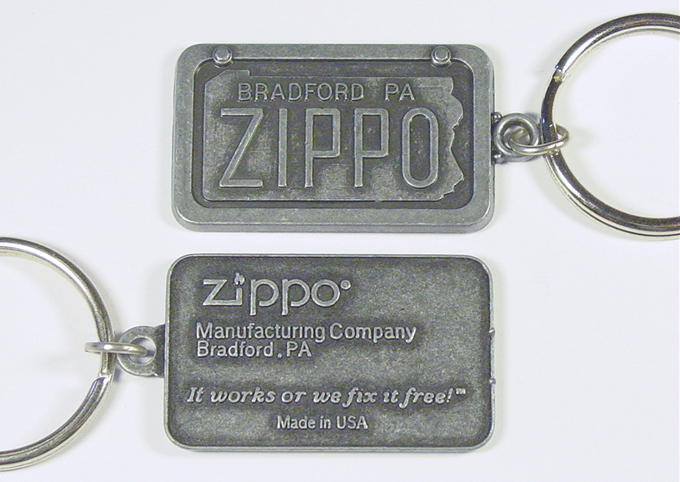 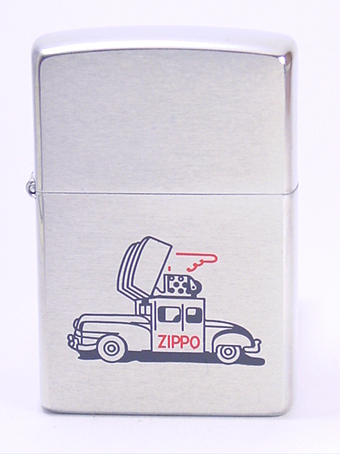 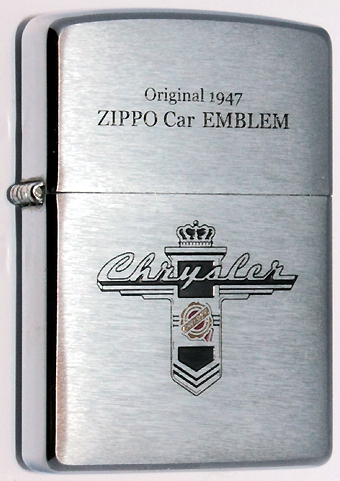 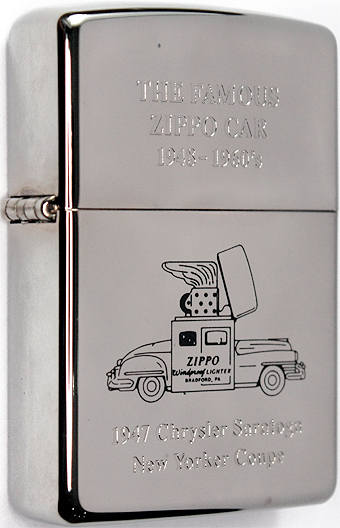 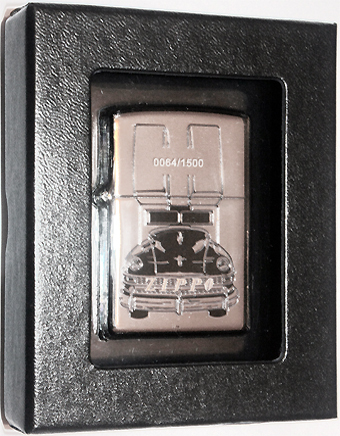 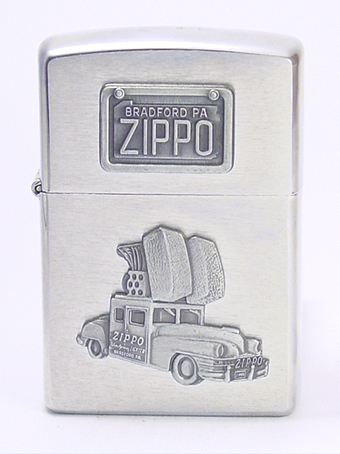 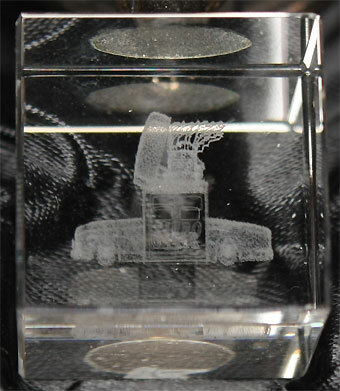 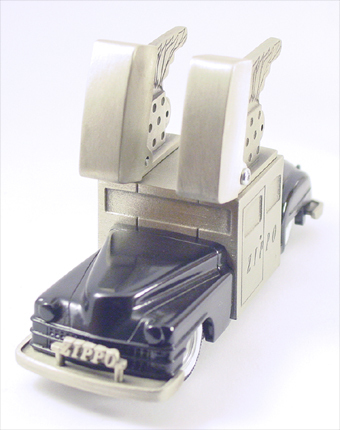 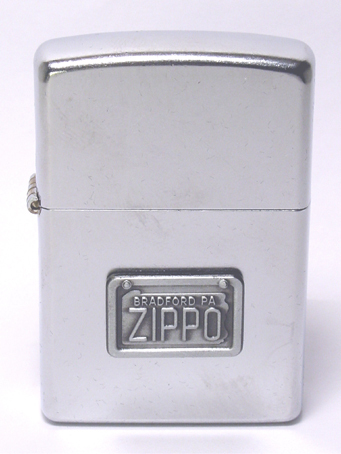 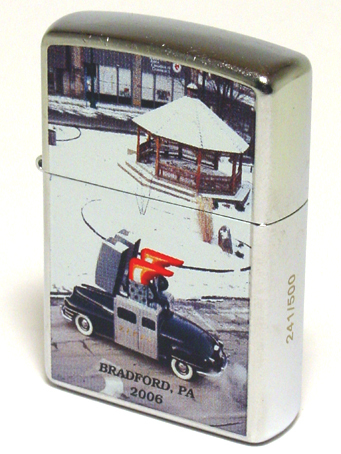 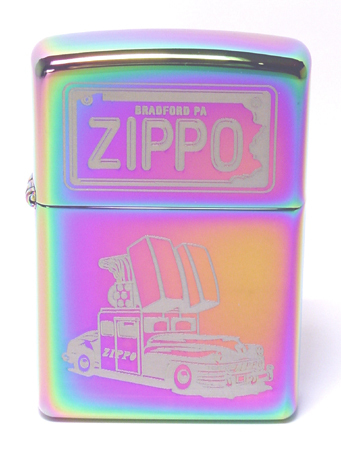 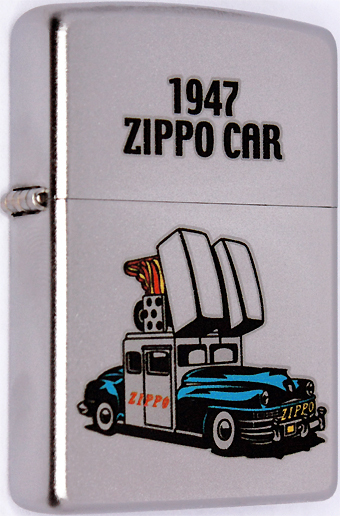 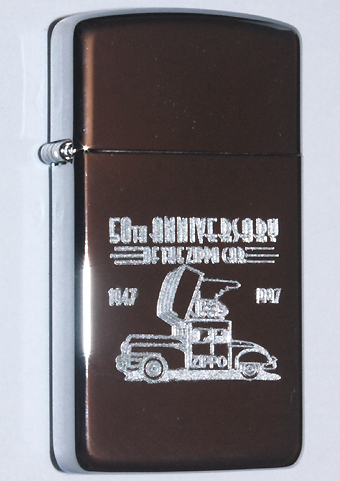 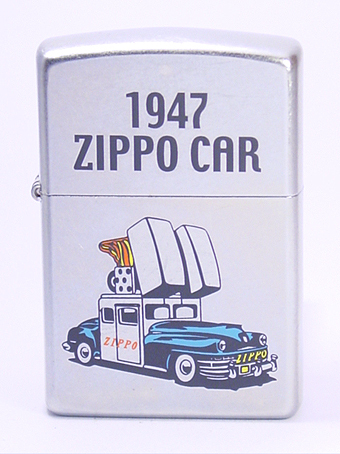 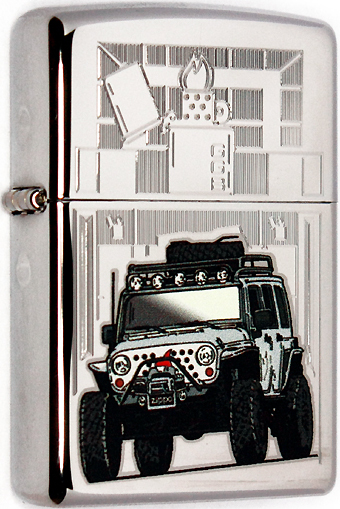 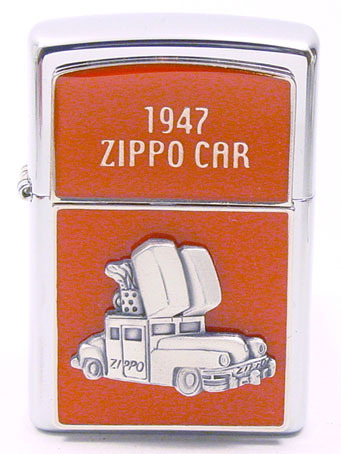 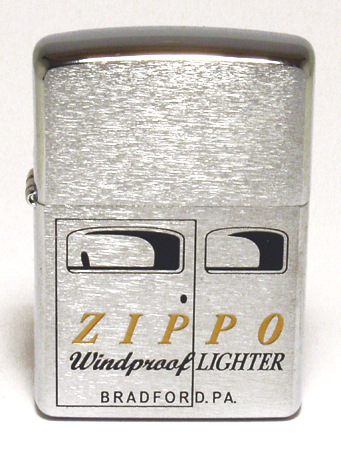 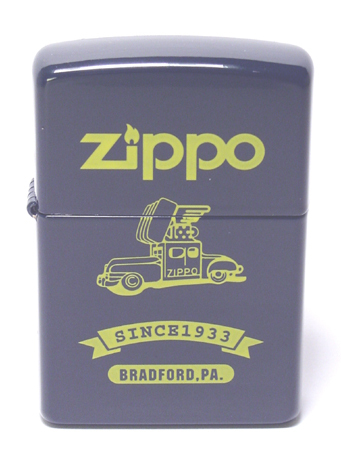 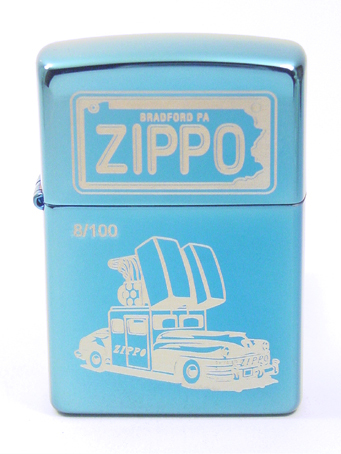 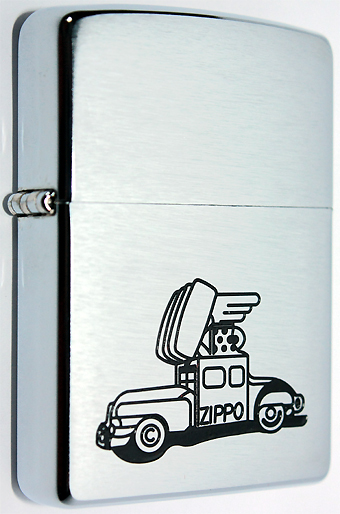 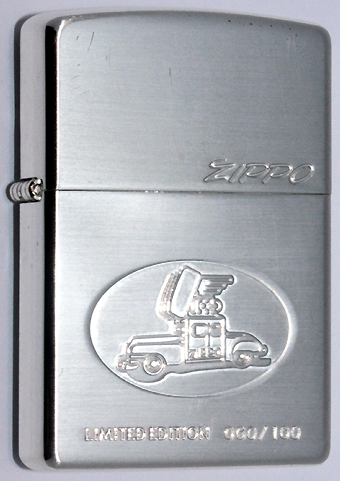 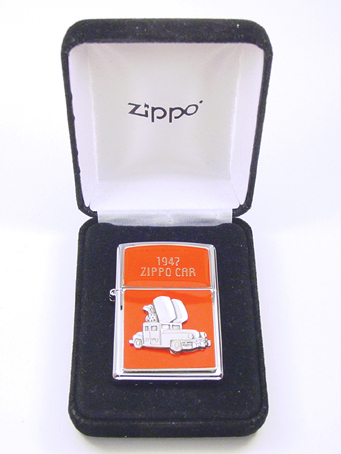 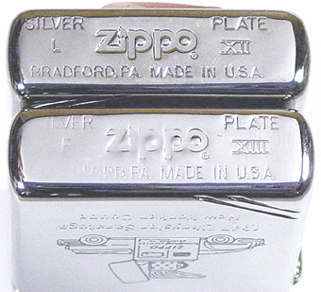 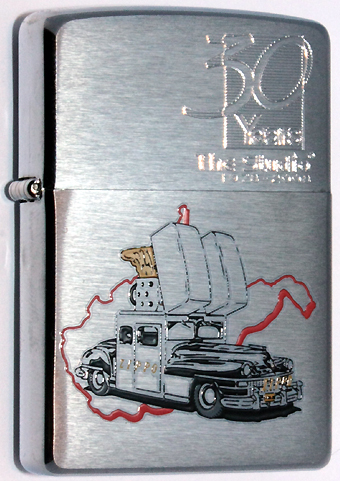 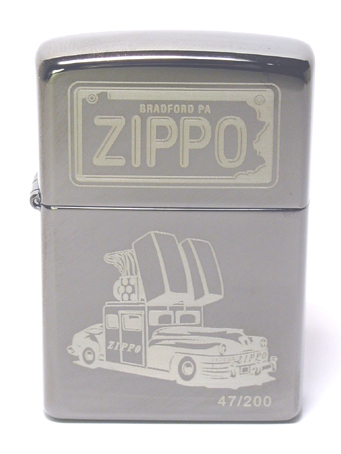 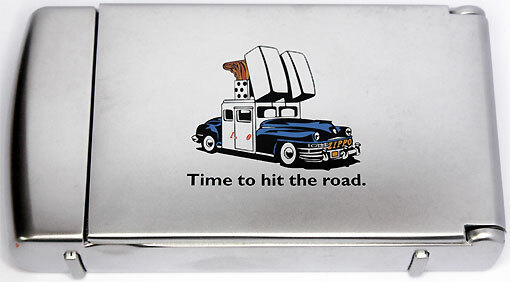 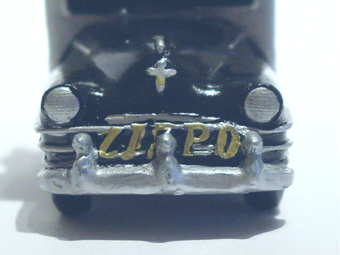 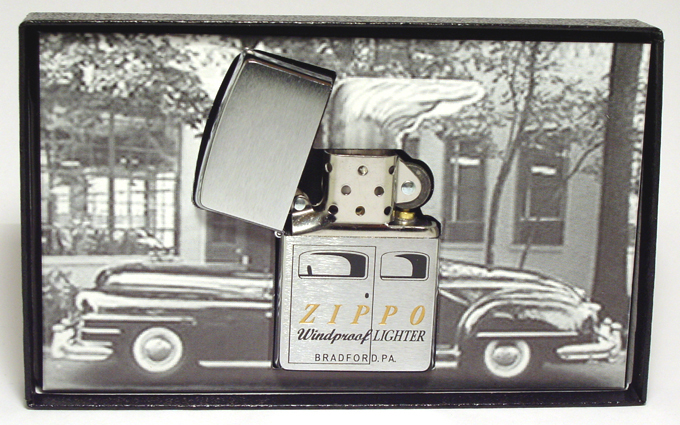 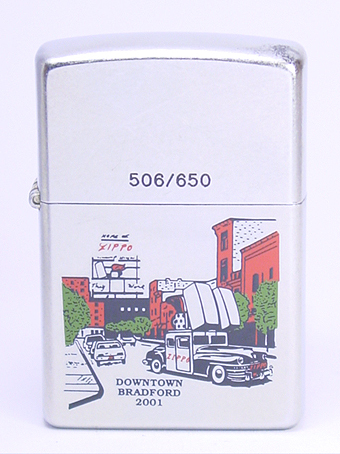 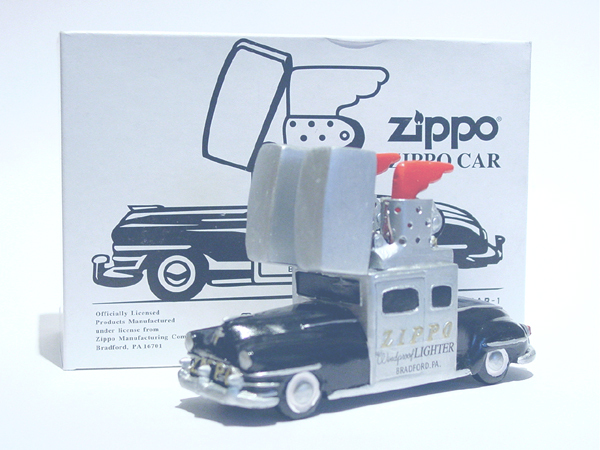 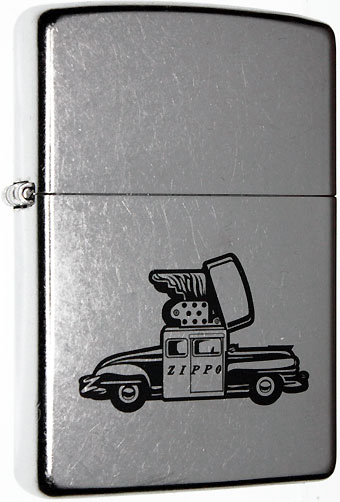 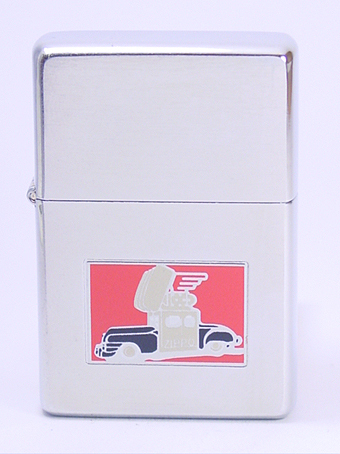 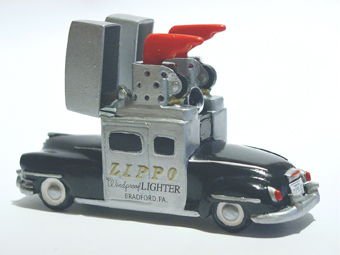 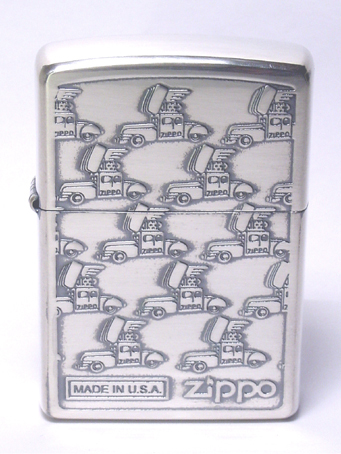 The Zippo Car commemorative features a brushed chrome lighter with pewter emblem replicas of the Zippo car on the lower half of the case, and its original Bradford, Pennsylvania "ZIPPO" license plate on the lid. 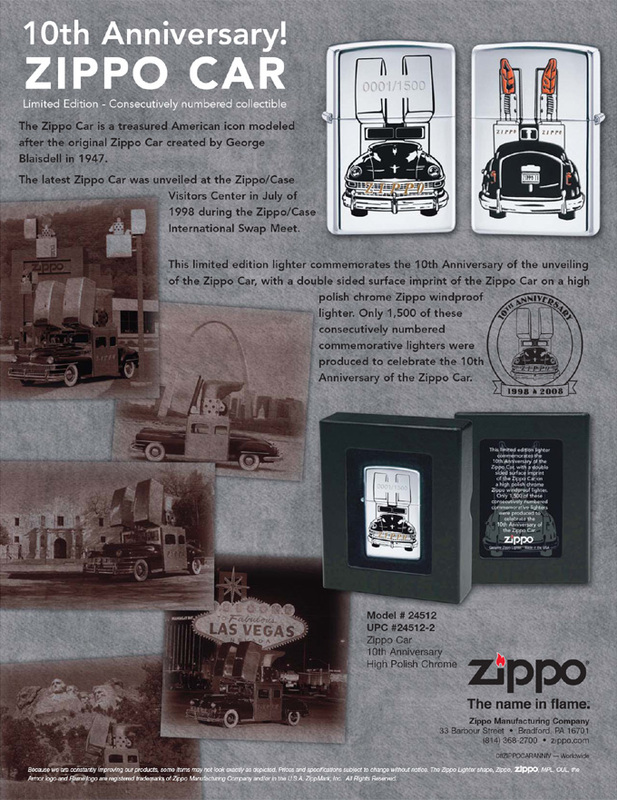 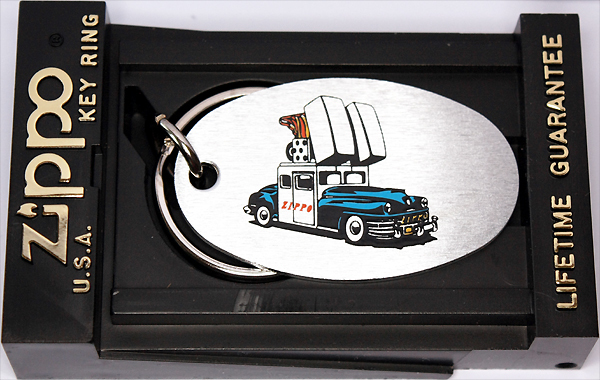 The commemorative set includes a pewter "ZIPPO" license plate key ring, and is packaged in a custom tin depicting nostalgic scenes of the many places visited by the car. 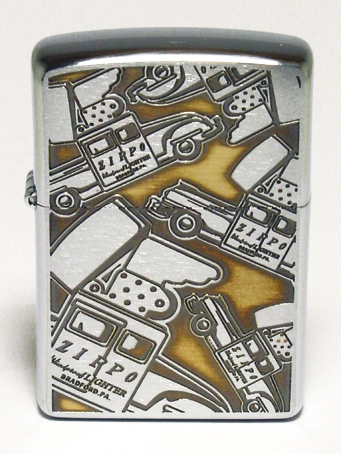 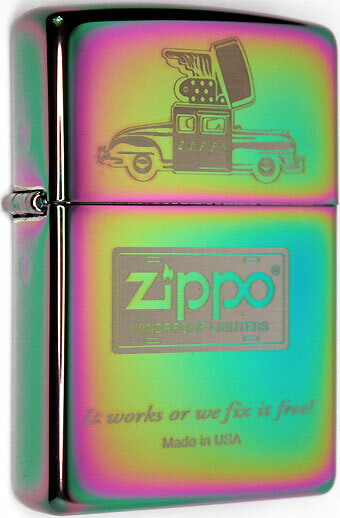 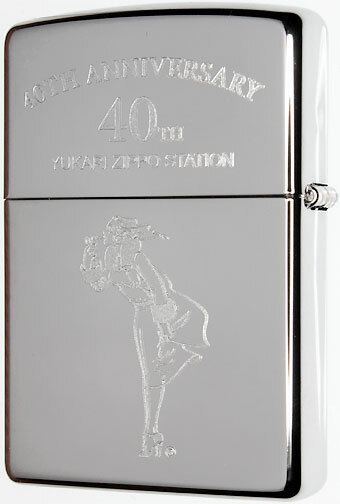 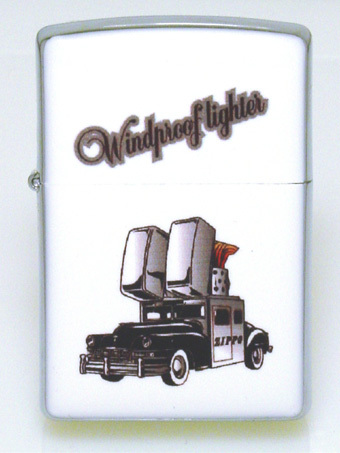 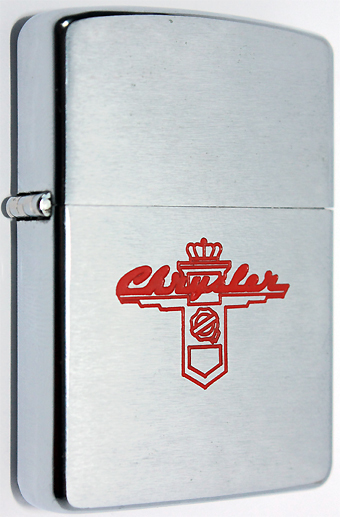 exclusively designed for Zippo Mfg.Co. 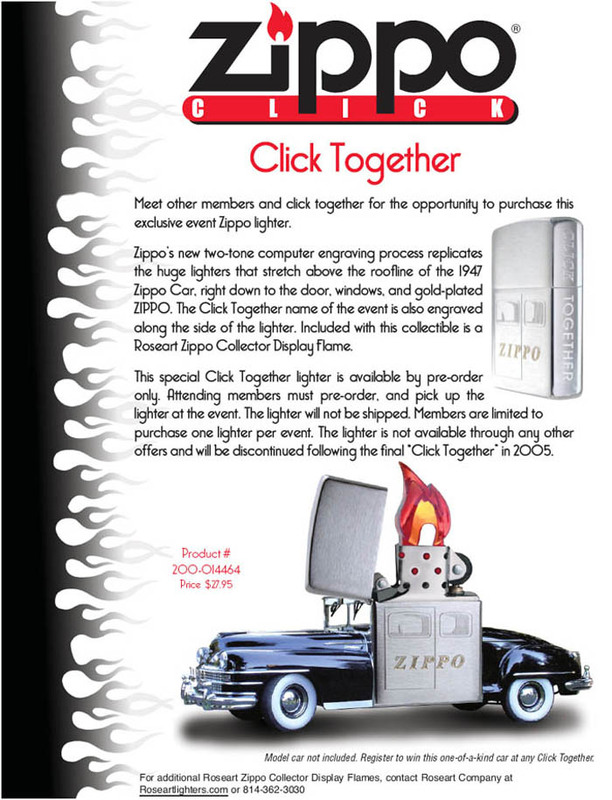 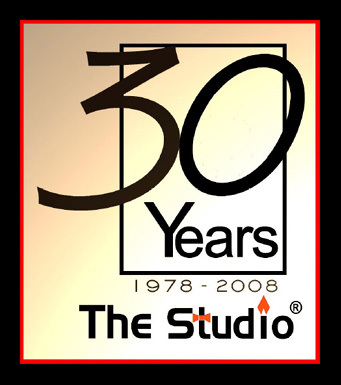 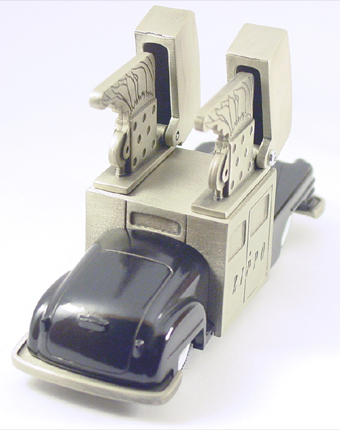 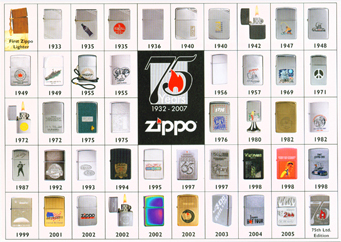 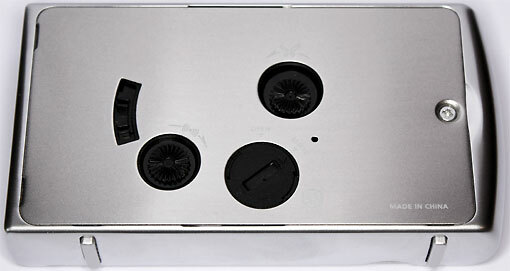 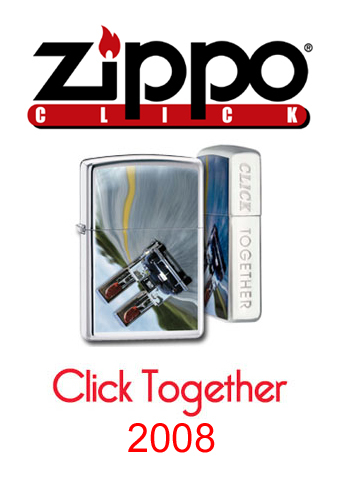 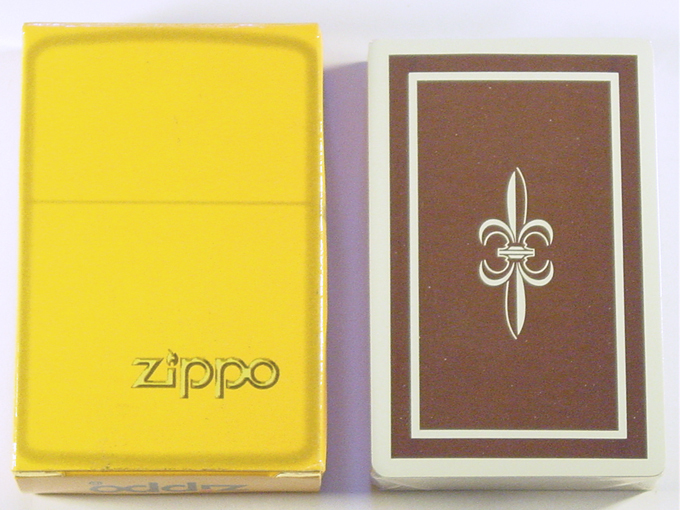 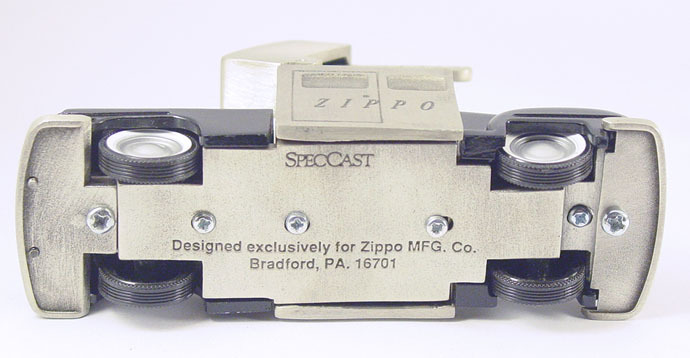 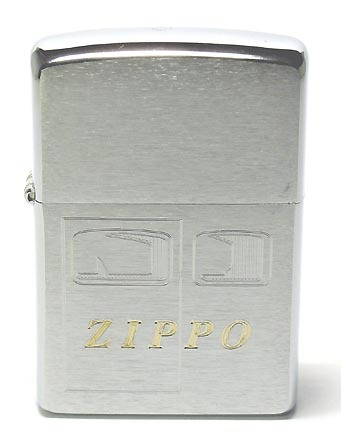 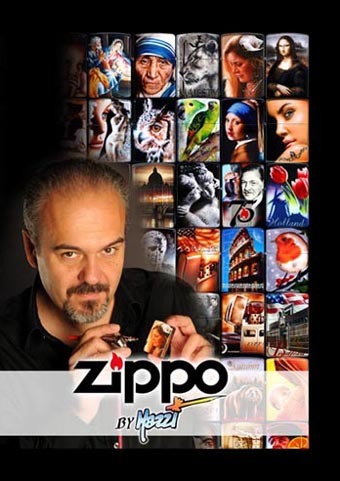 by SpecCast in July 1997.
in 1997 SpecCast produced the first series of 1.000 die cast models which were given to authorized Zippo dealers only. 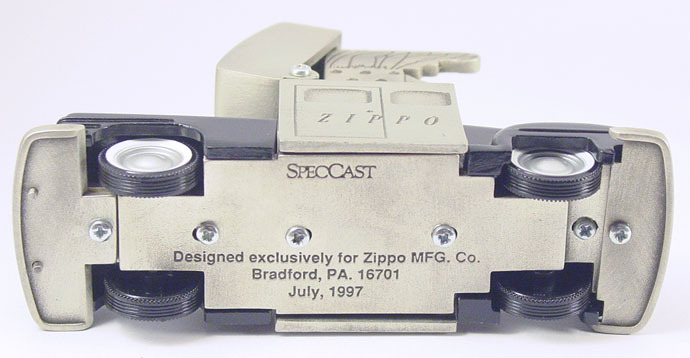 in 1999 SpecCast again produced a series of die cast models (quantity unknown) which were not stamped with the date of production at the bottom. 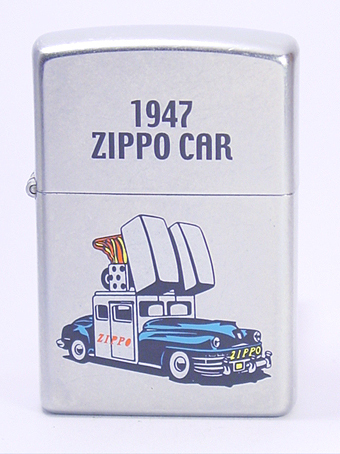 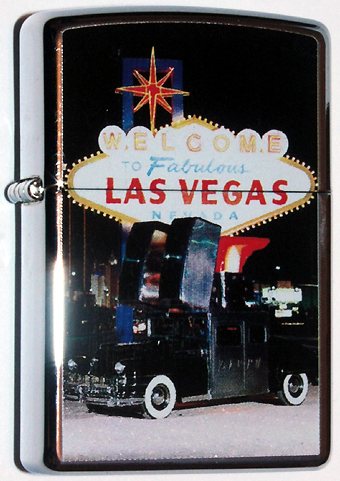 1997 Zippo Car tin sign, approx. 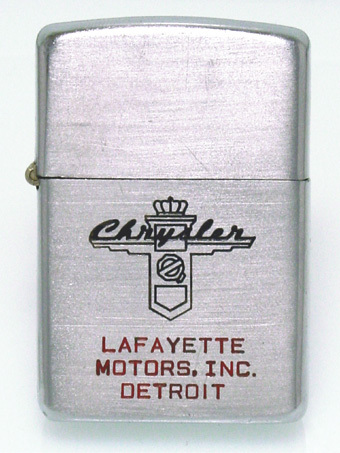 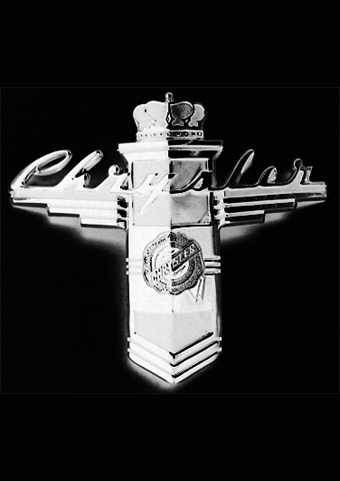 12" x 9,5"
Chrysler Corporation, Detroit, Michigan (1924). 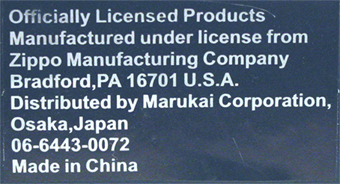 is located at 405 Lexington Ave, New York.